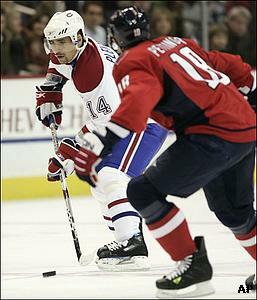 WASHINGTON (AP) -Cristobal Huet played as if he hadn't missed a game. Huet made 35 saves in his first outing since Dec. 1, helping the Montreal Canadiens beat the Washington Capitals 5-2 Thursday night. Canadiens coach Guy Carbonneau was surprised that Huet was as sharp as he was after missing six games with a groin pull. "I was anticipating he was going to get tired at the end of the game, but he didn't," Carbonneau said. "His focus was really good. He was around the puck. He made the difference." Montreal won its first game of a season-high six-game road trip, and after looking at the stat sheet, Carbonneau could only shake his head. "They outplayed us. They were better than us." Carbonneau said. "We were lucky to get the points. We got a few goals here and there, but we worked for our goals." Two goals came from Guilliaume Latendresse, whom Carbonneau benched on Tuesday in Montreal's 3-2 loss to Florida. "Nobody is happy when they're sat out for a game," Latendresse said. "My mind-set was in the right place." Latendresse is just 20, and he's already missed four games this season - twice as many as he did in his rookie year. "He has to play without the puck," Carbonneau said. "Sometimes guys decide to change their style, and that's never good for the team. I think tonight he came back with a good attitude." Huet's return was rough at the start. He faced 14 shots in the first period and felt a little shaky. "The first period was a difficult test for me to make sure I was into the game," Huet said. Both Huet and Washington coach Bruce Boudreau were concerned. "When we had a 10-1 shot advantage in the first period, I'm very worried. It happens all the time, the other team is going to come down, they're going to get one shot, and it's going to be in," Boudreau said. Boudreau was right. He watched Latendresse score his first of the game, tapping in a pass from Saku Koivu at 18:15 of the first period - 13 seconds after Capitals defenseman Tom Poti went off for hooking. The Canadiens took a 2-0 lead at 6:33 of the second period when Tomas Plekanec scored his 11th goal. He took a centering pass from Alex Kovalev and put a shot in off Kolzig's skate. Nicklas Backstrom scored his sixth as the Capitals cut their deficit to 2-1 with a power-play tally at 9:10 of the second. Backstrom's rebound of Alex Ovechkin's slap shot from the blue line beat an out-of-position Huet. Ovechkin has 13 points, seven goals and six assists, in 10 games. "Well, we lost, so what can I say? They played well on the power play and we made some mistakes and missed a couple of goals, and that was it," Ovechkin said. The Canadiens took a 4-1 lead on Sergei Kostitsyn's first NHL goal, scored during a power play in his fourth game. Alexander Semin's goal, his fourth of the season and second in two games at 10:08, made it 4-2. Mark Streit closed the scoring with 1:21 left to give Montreal a 5-2 lead. Notes: Secretary of State Condoleezza Rice attended the game. ... Washington D Brian Pothier fractured a thumb, and is week to week. ... Koivu has five assists in his last three games against the Capitals. ... The Canadiens won't play another game in Montreal until Jan. 3, though they'll return home for Christmas. ... Montreal D Mathieu Dandenault played in his 800th NHL game. ... The Capitals have outshot opponents in 16 of 18 games.